Upper Nile in South Sudan. Bar El-Ghazal, Equatoria, and Upper Nile regions of South Sudan. Sudanese, South Sudanese, and American religious and community leaders from the Jewish, Catholic, Presbyterian and Episcopal traditions. Dr. Henry Lujukole speaking to the audience at the Help Nuba-USASSCA educational event. August 26, 2012. The meeting to create USASSCA took place at Temple B’nai Jeshurun in Des Moines, Iowa, a Reform Jewish Congregation, hosted by Rabbi David Kaufman, HelpNuba.net, and the Steering Committees of Help Nuba and USASSCA. The proposal to create the organization was unanimously approved by the 150 national and regional community leaders present at the initial meeting on August 26, 2012. The gathering also approved the immediate creation by the Steering Committee of an Acting Board and Advisory Council for the organization which will be announced soon as well as the creation of the USASSCA Congress over the coming year to be inducted at the organization’s next annual meeting at the end of June, 2013. USASSCA aims to have members of the USASSCA Congress be elected representatives of regional communities from across the United States with the goal that the make-up of the USASSCA Congress representation from each community will resemble as closely as possible, the broader make-up of each regional community in the Diaspora. Standing on the steps of the Iowa State Capitol during the Walk to End Genocide. August 26, 2012. 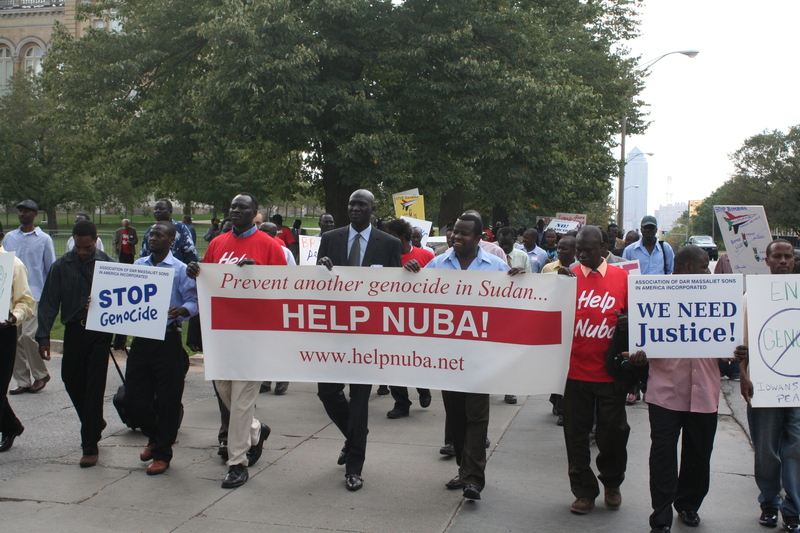 The Help Nuba – USASSCA Conference featured a Walk to End Genocide in which nearly 250 people participated, the vast majority of them members of the Sudanese and South Sudanese Diaspora. Anwar Elnour is a leader of the Darfur Community. Ali Hassan is the President of the Darfur People’s Association of Iowa. 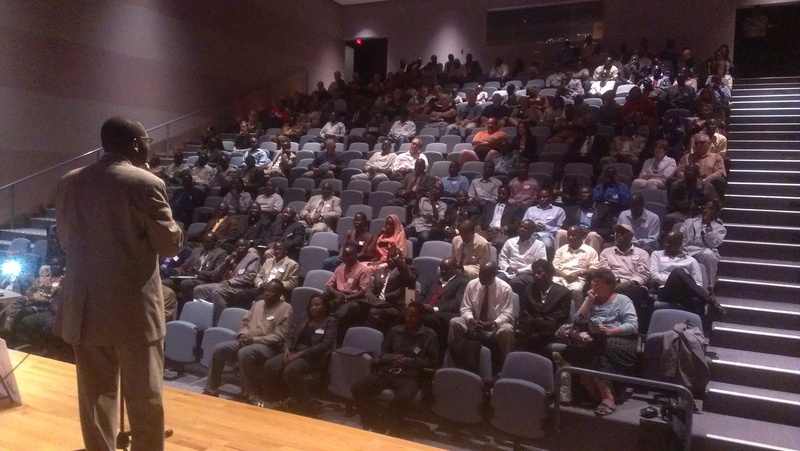 Mohammed Mhdi is a the Vice President of the Darfur People’s Association of Iowa. Yousif Adam is a Member of the Iowa Nuba Community Leadership. 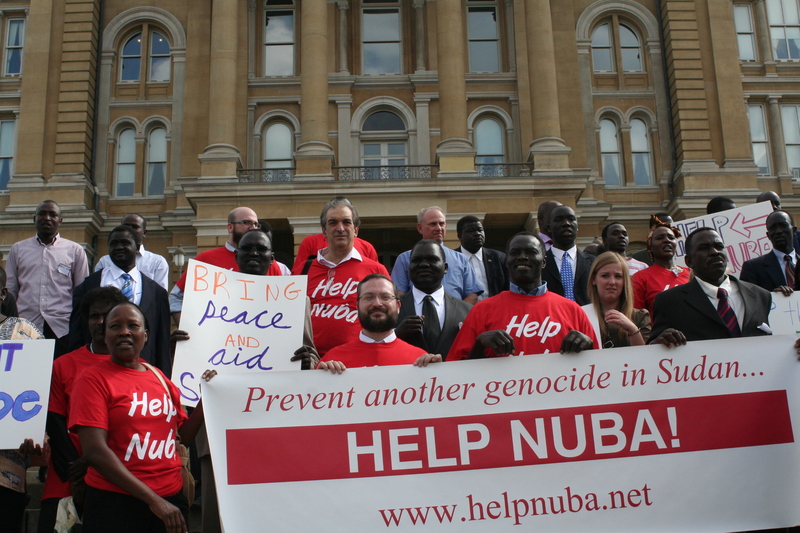 Idris Gardoud is a Member of the Iowa Nuba Community Leadership. Ekram Kachu is a Member of the Iowa Nuba Community Leadership. Sam Akec is the leader of the SPLM in Iowa and a representative of the Bar El-Ghazal region. Rev. Francis Chan is a Catholic deacon working with the South Sudanese community in Des Moines, Iowa and a representative of the Upper Nile Region. Rev. Goanar Chol is the Sudanese Ministries Resource Person for the Presbytery of Des Moines, Iowa and does peace work in Jonglei State in South Sudan. He is also a representative of the Upper Nile region. Henry Lejukole is a leader in the South Sudanese Community in Iowa and is a representative of the Equatoria region.